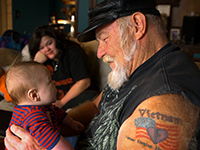 Nationwide Broadcast on PBS's "Independent Lens"
Oscar-nominated filmmaker Debra Granik ("Winter's Bone") returns to SW Missouri for her first documentary, looking at the life of Vietnam vet, Ron "Stray Dog" Hall, and shattering some stereotypes. Ron "Stray Dog" Hall lives in Southern Missouri where he owns and operates the At Ease RV Park. After years of living alone with his dogs, he is adjusting to life with his wife, Alicia, who is newly arrived from Mexico. Anchored by his small dogs and big bikes, Stray Dog seeks to strike a balance between his commitment to his family, neighbors, biker brotherhood, and fellow veterans. As part of the legacy of fighting in the Vietnam War, he wrestles with the everlasting puzzle of conscience, remorse, and forgiveness. With Stray Dog as our guide, we experience the restlessness of ex-warriors as he tries to make peace with what he can't change and weathers the incomprehension of those who have never been to war. Stray Dog navigates the pressures of everyday life including the economic survival of his grandchildren and the increasing poverty of his community. The arrival of Alicia's twin sons from Mexico throws into harsh relief the current state of opportunity that newcomers seek and that America can or cannot offer. Stray Dog continues to tally the cost of war, bearing witness to the soldiers coming home from Iraq and Afghanistan: both the dead and the living. The questions of contemporary American life loom larger and thornier, leaving us to wonder what is next for Stray Dog and his blended, multi-ethnic family. "Challenges stereotypes...An extraordinary look at a seemingly gruff, hard-core biker who cares deeply about veterans, country, and family; not to be missed." "Stray Dog is more than an intimate portrait of a Vietnam veteran. It's a subtle social commentary on the dynamics of class, race, and citizenship in twenty-first century rural America. It will no doubt become a staple of college courses on recent American history and military culture. This film is essential viewing for anyone who believes that 'supporting the troops' is more than a slogan on a bumper sticker." "Stray Dog challenges its viewers to see how even a wounded life, unfolding in a trailer park, sustained on a VA disability, can display enough love, kindness, integrity, compassion, generosity, and honor that it puts many if not most of us to shame. If this film doesn't haunt you, then you may be either an angel or an alien." "Recommended...Granik shows viewers the daily life and emotional struggles of one man. It's a subtle but no less powerful statement on how poorly the U.S. government treats its veterans, and a reminder to all viewers not to judge too quickly a worn and hardened biker by his outward appearance." "Stray Dog is valuable in many ways - as the sympathetic documentation of a family's perseverance in hard times; as an example of compassionate cinéma vérité; as a chance to spend time with some very interesting people - but perhaps its greatest virtue lies in its powerful, implicit challenge to the lazy habit of looking at American life through polarized red- and blue-tinted lenses." "Superb documentary...Stray Dog offers the most authentic cinematic portrayal of a veteran's postwar experience I have seen. Highly recommended for anyone interested in guiding conversations about men and women who endure combat and then struggle with civilian life." "An engaging portrait of an interesting American character, this is recommended." "A remarkable portrait not only of this particular man, but of a culture in a transitioning moment. As we welcome home even more generations of traumatized soldiers, it's the Vietnam vets that we have to look to to understand how this will affect these men and women down the road." "Heart-breaking and heart-warming...Incredibly nuanced and intricate. The film opens an interesting and important dialogue for educators and community leaders to facilitate around the complex, multiple layers of the human condition over the lifespan...Through our efforts to actively interpret his story and explain his involvement as a loving and committed husband, father, stepfather, grandfather, friend, comrade, and community member, we gain further insights that serve us and our communities well." "[A] superb slice of American life on the margins...In an era when many coastal Americans' ideas of the heartland poor come from hicksploitation TV series, Stray Dog provides a very welcome corrective." "Novelistic in its depth and breathtaking in its humanity." "A stirring, surprising, empathic portrait of a Harley-riding trailer-court king." "The clear-eyed film dedicates itself to breaking through the debris of clichéd, one-dimensional public impressions of vets, bikers, immigrant wives and kids and trailer-park lifestyles as it fashions an involving portrait of a deeply scarred man sustained by certain rituals and an unextinguished sense of empathy for others' problems." "Sympathetic without being sentimental or condescending...An enormously touching, understated look at an aging Vietnam veteran...Utilizes an observational, unobtrusive style that reaps major rewards, offering a casual glimpse into a series of lives on the margins of American society, touching on family, faith, love and survival with an effortless grace." "Stray Dog ponders some of the major issues in American life: the lasting impact of wars on those who fight them; the government's treatment of veterans, whose lives remain largely absent from public view; and the difficulties of immigration and assimilation. It's a film that starts as a character study and builds into something much larger." "Debra Granik's first documentary observes the finest tensions and frustrations the combat veteran works through via compassionate gestures and a simple family life. Lovely film with a perfect ending." "This is a film that blows apart your preconceived notions of how a documentary can be put together. It is a perfectly told story with vivid characters, an acute sense of place and many marvelous emotional beats." "It vibrantly encompasses the themes of middle American poverty, immigration, the changing times, the unchanging tragedies, the complex feelings of loss, disorientation, mourning, confusion, anger and finally, some sort of redemption." "By focusing on Ron Hall's experience, Stray Dog ends up being 'about' a lot of topics: veteran's affairs and welfare; post-traumatic stress disorder; aging; changing definitions of 'family' and 'masculinity'; immigration, language and, well, the American Dream." "Granik has a bona fide star in Hall, whose hirsute appearance and occasionally gruff demeanor mask his overall sensitivity and salt-of-the-earth compassion."